Starting at 9am on May 11th we will have all 18 holes open for play (with one temporary green) and power carts will be allowed ON CART PATHS ONLY. We are now taking tee times for 18 holes seven days in advance. The first tee time is currently 9am but will change to 8am on May 18th . On Foothills #4, #5 and Rockies #5 - A ball in the closely mown area of the above holes (fairway height or shorter) can be treated as lift, clean and place within one club length and not closer to the hole. You can begin posting your scores to Golf Canada with this Local Rule in effect on Friday May11th! CART PATHS: Until further notice cart paths will be allowed on the cart paths ONLY. We will be strictly enforcing this rule and abiding by our power cart usage policies. If you are not familiar with our policy please ask for a copy in the golf shop. Our menu at both seatings will include: Scrambled eggs with bacon and sausage, hash browns, assorted muffins and a fruit tray. PLUS poached Salmon with lemon dill sauce, chicken with mushroom gravy, scalloped potatoes, homemade soup, caesar salad and pasta salad. Call 780-865-0060 to make your reservation! We will begin opening the Driving Range at 8am on May 18th. Golf Shop - 8:30am to 9pm until May 17th. 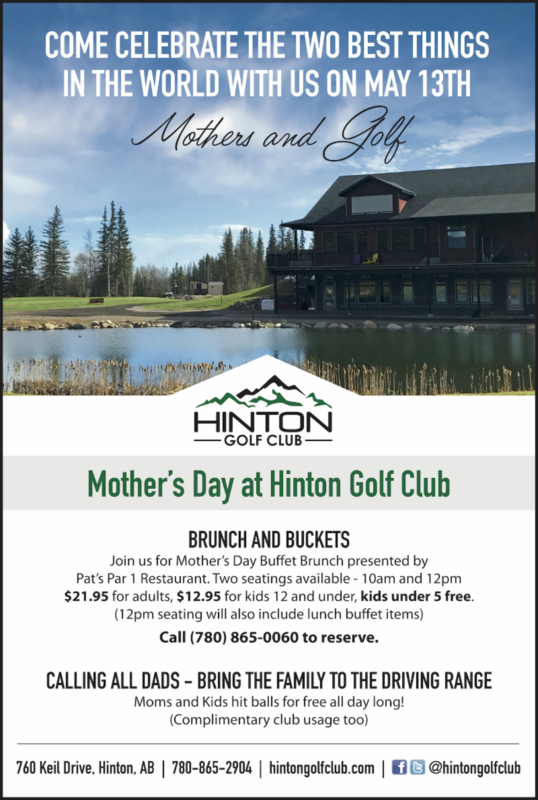 Call (780) 865-2904 and press 1 or email info@hintongolfclub.com. Office - Monday to Thursday 9am to 1pm. Call (780) 865-2904 ext. 3 or email accounting@hintongolfclub.com. Management - Call (604) 506-2226 or email jeff@ckgolf.ca. Board of Directors - Email president@hintongolfclub.com.